I have trained myself to look for the loner when it comes to water and shorebirds. Experience tells me those are the ones that end up being the most intriguing. In the birding world, it is the intriguing ones that get you excited because those are the ones that end up making the latest checkmark in your life list. Contrast that with staring at a cover of Coots – if you do not have a Coot you are in luck, already been to any body of water near me, then you typically utter “more damn Coots” and move on. Although not as diligent on tera-firma, I do try to keep an eye out for those brief encounters. 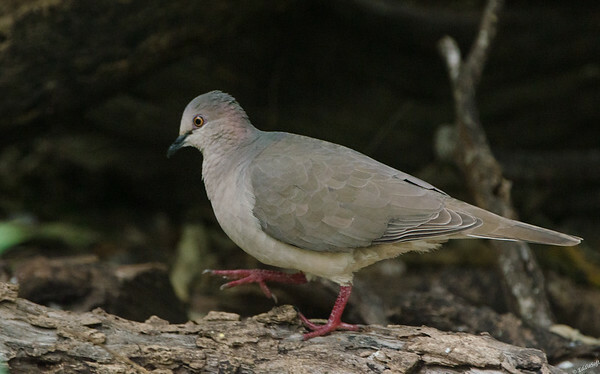 A few posts ago, I featured the White-Winged Dove (link here). That encounter at the Laguna Atascosa National Wildlife Refuge is the location for today’s post. Most of those shots were captured from within their bird blind just out from the visitor center. While getting that +1 in the tin, another creature came darting out from the ground cover, made an aggressive move toward my subject and then raced back into the shadows. Hit the jump to read more about this elusive bird. By the time I figured out it was a bird and got the glass on point, it was nearly back in the shadows. Basically got a four burst shot off before it was gone for good. At the time it was simply dismissed as another White-Tipped Dove that wanted to play a trick on his brother and do some photo-bombing. I went back to taking more shots of the originally targeted White-Winged and didn’t think much about it the rest of the visit – beyond commenting how glad it was it didn’t scare off my primary subject (now that others had joined me in the blind, I was conscious enough to say that under my breadth). Back in the digital darkroom preparing the images for the blog the stealthy intruder burst came up. 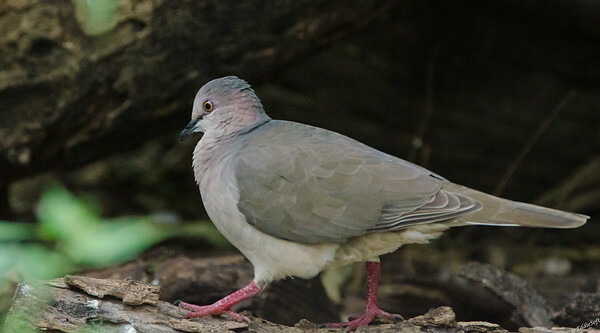 Something was obviously missing from this Dove – maybe this wasn’t the same species. Only the middle two shots were actually decent enough to show people and even these two were slightly off the preferred focus mark. If you take notice of the edges of the wings they do not have the signature narrow white band on the edge of the wings. It also had a mark free face unlike the White-Winged and Mourning. To complete the dismissal of the Mourning, there were not indicative black spots on the back. I had seen the Inca before and that species had very sharply defined markings and carries a redder look. Like the isolated bird on the water, this elusive bird provided a new +1. After looking at the rest of the Doves the White-Tipped variety seemed the best fit. The part that was confusing me was the inability to see the white on the tips of the tail. After some additional searches on the web, learned that the white tips can be difficult to see on the ground – you can just make out the white edging along the tail feathers. The Tipped also has the iridescence feathering on the back of the neck (note, this develops in adulthood, the juveniles do not have that nor do they have the eye coloring). This species only hangs out in the southernmost tip of Texas and then down into Central America and stops in the northern tip of South America. A region even more restricted than the White-Winged variety. I did appreciate Audubon’s site noting they will escape rapidly to the shadows of the underbrush if disturbed – behavior verified. Cornell noted that they can be aggressive – also behavior verified. Sorry for the limited pictures of this new bird to my list. Also could have executed a bit better on the shot – to my credit though, it was all of like 3 seconds from sighting to wondering where the hell it went. Super stoked I was able to get something good enough to officially claim on such a limited North American presence. In case you are wondering, unlike the White-Winged variety, the White-Tipped has not garnered any references in well-known lyrics hehehe.